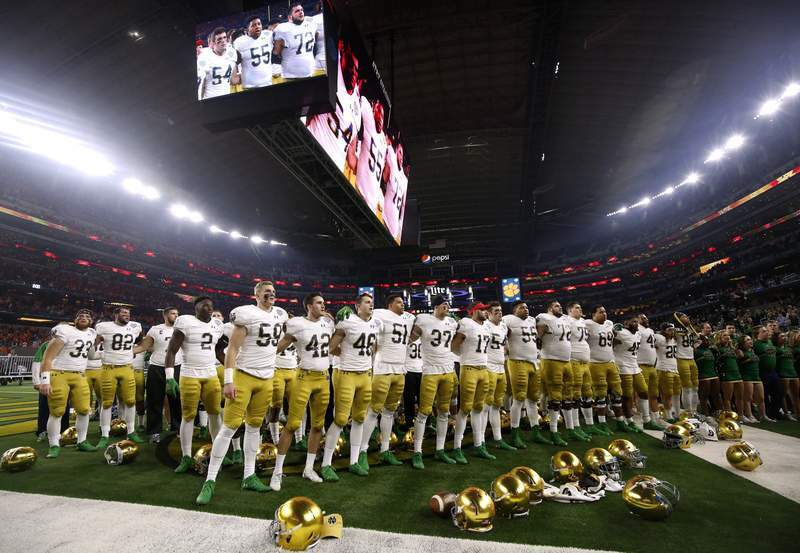 Associated Press Notre Dame players stand in the end zone singing in the direction of their fans after their 30-3 loss to Clemson in the Cotton Bowl on Saturday. The Irish finished 12-1 and have another long off-season ahead. ARLINGTON, Texas – At this time two years ago, Notre Dame was at the nadir of the Brian Kelly Era, coming off a Charlie Weis-like 4-8 season, with many fans calling for the coach to lose his job. Athletic director Jack Swarbrick stuck with Kelly and two years later the Irish completed a 12-0 regular season and reached the College Football Playoff. Notre Dame's loss to Clemson in the Cotton Bowl does not diminish the speed and scale of that turnaround. To get here, Kelly began delegating more to his assistant coaches, allowing him to build deeper relationships with his players and help them be better-prepared on game days. It was no small transformation for Kelly, who has been a head coach since 1991. The result of those changes has been back-to-back 10 win seasons for Notre Dame for the first time since 1992-93 and a 22-4 record over a two-season stretch. The 30-3 loss to the Tigers on Saturday will leave a bitter aftertaste to this season for many fans, but the players believe this is still a program on the rise. Notre Dame will have to move on without a bevy of seniors, many of whom returned for a fifth season with the Irish because they felt this team had a chance to win a national championship. Players like Sam Mustipher, Drue Tranquill and Alex Bars decided to play one final season with the program they had helped reconstruct from the ground up after 2016. They fell short of the ultimate goal, but, over the last two seasons, that group of upperclassmen has provided stable leadership and captained the team to consistent success. “I left the field today and I know there was nothing more I could've left out there,” Mustipher said after the Cotton Bowl. Bars was lost in the middle of the season to an ACL injury, costing Notre Dame its best offensive lineman but also giving it a chance to begin auditioning replacements. Now, the Irish must begin reckoning with the loss of productive players like Tillery (seven sacks), Tranquill (86 tackles, nine for loss) Te'von Coney (123 tackles), Dexter Williams (995 rush yards, 12 touchdowns) and Justin Yoon (all-time leading scorer in team history). There are also a few players who still have eligibility remaining, but might be departing the Irish for the NFL. All-American cornerback Julian Love and top wide receiver Miles Boykin are the most prominent members of that group and their decisions will have an important effect on the makeup of next season's team. Neither has said when he will make his decision. “I've got to get back and talk with my family and the coaching staff, and decide from there,” Boykin said after the Cotton Bowl. The Irish started their preparation for this season almost immediately following the Citrus Bowl win over LSU last year. It was the most comprehensive off-season of Kelly's tenure, fueled by the idea that the team had returned enough talent to make a national title run. It will take that same commitment to return to the College Football Playoff this year. “It's going to be another long off-season,” Tranquill said. “I think the guys just need to stay focused on the task at hand. I think (the Cotton Bowl) was a great learning experience for the younger guys coming back next year. The 2019 season begins in eight months and one day.